AGNITAS can provide out-of-the-box software for email marketing and subscription management that is also tailored to your specific requirements. We can not only supplement existing feature sets for you with your own functions, but also implement any non-standard concepts you may have. And we will provide support when it comes to the integration of our software in your existing IT infrastructure at whatever level you require. Our SaaS version will even undertake system administration, hosting and whitelisting for you. Data protection and data security are always our first priorities. When it comes to our software, we also offer advice, full maintenance, training and efficient support services. In addition to the software for intelligent direct marketing campaigns, we can also provide content that is guaranteed to attract the attention of your customers – the greater the extent to which the content is designed to conform to the interests of recipients, the more likely it is that your message will get across. You can select content from various categories (e.g. fashion, lifestyle or technology news) and modules. Content is updated daily and can be used as a standalone feature or can be integrated in your communication. Think differently – and better! Our software products are continually optimized and developed further. The suggestions and ideas of our clients also flow into our development process, as do insights gained from numerous studies. We think ahead and optimize your e-mail marketing success. 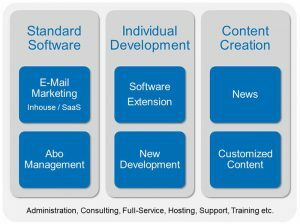 With E-Marketing Manager, we are the only supplier to develop, license and operate a complete product portfolio from Open Source to a full-service solution for e-mail and marketing automation. We can also fully meet growing requirements. You decide what type of E-Marketing Manager fits best into your infrastructure: License, hybrid license, Software-as-a-Service, Private Cloud (hosted license) or Amazon Cloud. We are also flexible when it comes to the choice of databases – you can choose between MySQL and Oracle. Flexible integration into your IT infrastructure – you choose the hardware solution that best fits your needs whether AGNITAS servers or your own. We are also happy to take on the installation and maintenance of your equipment in our data center or in-house on your premises. EMM can be specially customized to meet your needs and is also available as a white label solution in your look & feel. One of the world’s leading manufacturers of premium-class automobiles, for example, uses an individualized white label solution from us. Whether by telephone or by mail, our Support team is always happy to help you – and without long wait loops running through a call center. You speak directly to one of our Support team members and your query is handled as quickly as possible. If you do not possess the resources for the sending of your e-mail campaign, we can also offer you full-service solutions whereby we take on all the work associated with sending. We implement “portable” projects for you, i.e. if so desired we set up the project such that it can be further developed and handled by you. AGNITAS has been working with experienced service partners from various online marketing sectors for a long time in order to supplement its know-how and extend its range of offerings available to you. We would like to introduce you our long-term partners below. Thanks to the cooperation between AGNITAS AG and MarAnCon, customers profit from Name Day mailings, date-driven customer communication and much more. With its team of highly experienced statisticians, mathematicians and dialog marketing experts, MarAnCon offers a broad-based consulting portfolio in the areas of database marketing, customer scoring, data mining, social media marketing, online marketing, geo-marketing, marketing strategy and newsletter optimization. The whitelisting program from Return Path, with exclusive certification by the company, offers broad acceptance in the B2B and B2C markets. AGNITAS participates in the program and meets the standards regarding e-mail infrastructure and sending behavior. Thanks to the largest whitelisting program in the industry, marketeers can considerably improve transmission speed and incoming post rates. Moreover, with 10 years’ experience, Return Path is the world’s leading company in the area of e-mail analysis and provision as well as preparatory processing and the results gained from these activities. One to Smile creates personalized images and graphics based on user data. By personalizing the image, target groups can be emotionally integrated into print products or multimedia communication in a lasting manner. This personal version for each addressee or user aids remembrance of the brand and the aim of the campaign. The inbox preview provided by Litmus is an enrichment for recipients of optimized mailings. The preview is based on the layout and template settings of the mailings. Whichever device and whichever mailing software the recipient uses, the inbox preview supplies the corresponding view. Mailings can therefore be optimally adapted.